If you had asked me nine years ago what I thought of the James Bond series I would have first rolled my eyes in disgust and then immediately confessed to never actually seeing any of them. Then “Casino Royale” came out, and while I didn't absolutely love it, I definitely didn't hate it. It felt like a Bond movie anyone could like and it was a perfect introduction for those like me who felt indifferent to the entire franchise. When “Quantum of Solace” came out I could finally say I hated a Bond movie that I had actually witnessed in its entirety. And then in 2012, everything changed and “Skyfall” officially made me a fan. It changed the game arguably even more so than “Casino Royale” and instantly became one of the most beloved—critically and commercially—films in the series. “Spectre” continues that success in a way that is almost polarizing. It feels like the version of “Skyfall” that was made for fans of the series, which immediately isolates many people who loved watching the Daniel Craig films evolve the way they have. To put it simply, “Spectre” is a great, if flawed, modern Bond film; not as good as “Skyfall” but certainly one of the better made films in the series. Does anyone really care about the plot of a James Bond movie? I can't even attempt to describe the plot here and not because it's confusing in a “Quantum of Solace” type of a way, but because it's almost pointless in describing whether a James Bond film is good or not. This latest entry, also directed by master filmmaker Sam Mendes is sort of the more “fun” version of "Skyfall." It has way more of the cliched Bond moments and has certain elements to specifically cater to the fans. But that's fine in my book because since I've spent that last few years catching up on the Bond films they're all fresh in my mind and it's always fun getting the references. It turns out the main baddie here played by Christophe Waltz was the true mastermind behind the other baddies in the previous three films. No reason to spoil who this character really is, though fans will not be too surprised. The Bond girl, is well played by Lea Seydoux and finally gadget man Q played by Ben Whishaw has a more important role. Guardian of the Galaxy's Dave Bautista is also great as a Jaws-like silent baddie called Mr. Hinx. What makes Spectre, and for the record Skyfall, such great successful James Bond films, is how well polished they really are. Gone is the campy silliness that flowed through the Bond films of the 70s and 80s. When you watch a Roger Moore James Bond film you expect, and want, that silliness. Daniel Craig is all business. It's an almost entirely different portrayal – you either like it or you don't. It definitely works as a modern interpretation. And this more suave, and realistic, version pairs well with the fantastic production value and cinematic elements, like more realistic action, characters, and photography. Cinematographer Roger Deakins who has a goldeneye behind the camera was a godsend in the last film; here we get Interstellar's Hoyte Van Hoytema's camerawork with almost equally fantastic results. There's no more corny music; composer Thomas Newman grounds the film in a modern score that most likely won't sound dated twenty years from now. Cinematically speaking everything is just as good as “Skyfall;” including a standout opening sequence (featuring a great long take and thrilling helicopter fight). 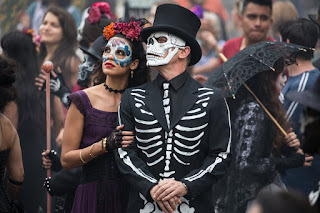 Trailer for Spectre on TrailerAddict.